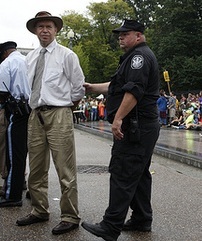 James Hansen was speaking at Freedom Plaza in Washington this week prior to a march and a sit-in in front of the White House, an act of non-violent civil disobedience which resulted in his arrest along with a hundred or so other participants. They were protesting against the Appalachian mountain top removal coal mining. Hansen’s speaking style is hardly that of an orator, but his address included some striking statements which convey very adequately the urgency he feels as the result of his work as a climate scientist. ’First, the government is failing to protect the future of young people, knowingly allowing and even subsidizing actions that benefit the few at the expense of the public and at the expense of all life sharing this Earth. ’Second, the legislative and executive branches of government knowingly propose actions that demonstrably and utterly fail to preserve our climate, and the environment for life. ’Third, our government allows and contributes to a great hoax, perpetrated on the public by moneyed interests, aimed at confusing the public about the reality of climate change. This is not the first time Hansen has been arrested. And it may not be the last. He was arrested in June of last year when with others he deliberately trespassed on the grounds of the Goals Coal plant, in Sundial, West Virginia, again to protest mountaintop-removal mining. But whatever path may be open for action in the US Hansen continues to put emphasis on the education of the public. As a scientist who has done a great deal to explain the situation resulting from rising greenhouse gas emissions and to articulate the solutions Hansen has already contributed greatly to the educational process. His willingness to engage in civil disobedience highlights the gravity of what he and other scientists have uncovered in our deteriorating environment. We salute him for his continuing engagement.